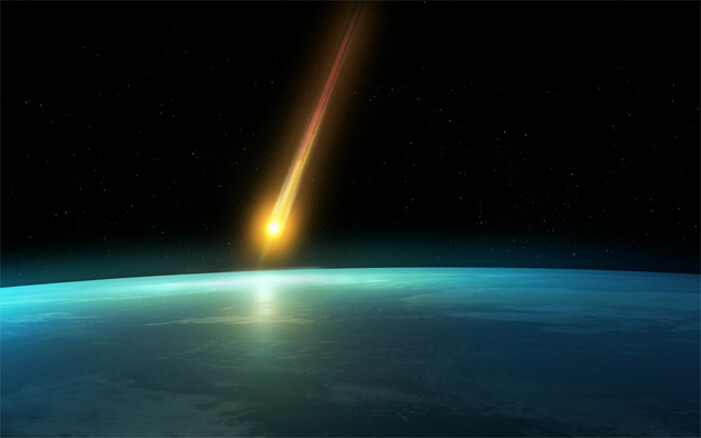 Panspermia is the theory that life is a cosmic phenomenon, and did not start on Earth as a chemical process, but was brought from elsewhere in the Universe. Neopanspermia is the theory that microbes are still arriving up to this moment. My involvement in investigating the panspermia theory began in 2001 by collaborating with Chandra Wickramasinghe on many projects, and later in analyzing the results from the Indian balloon mission (2002), in which a large balloon was sent up into more than 40 km in the stratosphere, collecting microbes using the cryosampler loaded on it. Later in 2013, I was fortunate to have met Chris Rose and Alex Baker who helped me in designing our own sampling balloons to sample the stratosphere looking analyze our findings. For many years, before the turn of the present century I lectured to first year biology students on the subject of the origin of life and mentioned the theory of panspermia i.e. the idea that, instead of originating on Earth, life arrives here from space. The Theory has a very long history with the modern version being developed by Sir Fred Hoyle and his one-time PhD student, ChandraWickramasinghe. I was fascinated by this theory but at the time we are talking about could only read about it and teach to my students. In around 2001, things changed dramatically however, when I wrote an article for a microbiology magazine in which I defended the theory of panspermia and Hoyle and Wickramasinghe’s championing of it. At that moment I was unaware that my actions would lead me to the most exciting, as well as frustrating, period of my career and life. Chandra Wickramasinghe, who was then at Cardiff University, saw my letter an invited me down to South Wales with a view to suggesting that I consider working with him on the microbiological aspects of panspermia. Although I had assumed that microbiologists would be lining up to work on the theory, the opposite was the case. It seemed that most scientists, aware of the controversial nature of Hoyle and Wickramasinghe’s work were avoiding them, only too well aware that they were likely to lose their status, promotion prospects and research grants if they did so. Since I have never allowed any such considerations influence my work I readily jumped at the opportunity of working with Chandra (Unfortunately, Fred Hoyle had by then died and I never got to meet my fellow “no- nonsense Northerner”). By the time I visited the Cardiff the team led by Chandra and collaborating with Indian scientists had shown by light microscopy and fluorescent staining that bacteria could be isolated from 41km in the stratosphere; i.e. fours time the height of a cruising jumbo jet. Despite what some unthinking people believe particles like bacteria do not just float up to this height. The team had not however isolated microbes from this extreme height. Chandra therefore gave me this task. I soon isolated two bacteria and a fungus from the 41km samples. Why did I so quickly achieve this isolation which had beaten the Cardiff and Indian teams? Firstly being old, established microbiologists with some 45 years of experience growing microorganisms I had a few, green fingered, tricks up my sleeve. Growing microbes is a bit like gardening; experience is a very important part of being successful. Unfortunately many modern microbiologists are very good at isolating and working with DNA but often have n little knowledge of the isolation techniques I was immersed in as student and researcher. Serendipity, or chance, also played a major role in the isolation of bacteria from the 41km samples. This is how it happened. I asked one of my inexperienced postgraduate students to make up various media on which we hoped to isolate bacteria from the 41m samples. One of these media was PDA, a fungal growth medium made up of potato, dextrose and agar. When he bought the medium the prepared medium to me it was obvious that there was something wrong, it was too soft. The inexperienced student had taken a container of very old PDA, which should have long since been discarded, and used this ancient powder to make the medium, which turned out soft. Most scientists would have told him to throw this away and prepare some fresh medium which would have solidified in the proper way. However, I am a great believer in the power of serendipity, so we used this soft medium to try and isolate bacteria from the 41 km samples. Amazingly, this was the only medium which gave rise to bacterial colonies (and a fungus), Why? It did not take long for me to come up with an answer. In order to preserve bacteria in culture collections they are often freeze-dried. In order to re-grow them from such a freeze dried state we use a soft agar. 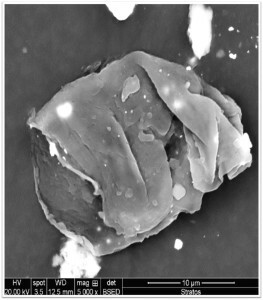 Any bacteria present in the stratosphere would be naturally freeze dried so in accidently using a soft PDA medium we had provided ideal conditions for the isolation of freeze-dried bacteria from the stratosphere; it was this example of serendipity which allowed us to isolate bacteria from the 41km samples. We eventually published our work in peer reviewed journals and were initially met with the usual criticism that it must be all based on contamination. However, since then the presence of bacteria and fungi in the stratosphere has been confirmed by groups (using different sampling and isolation procedures) from NASA, Japan and India. Further Sampling of the Stratosphere-Evidence that Life is Continually Arriving to Earth from Space. The high stratosphere sampling programme conducted in collaboration with Indian scientists eventually came to end. Our evidence that bacteria and fungi can be isolated from 41km was repeated by a number of groups, including NASA and Japanese workers, who used different sampling approaches; despite all the claims that our findings resulted from contamination, it is now generally accepted that microbes do exist at these heights. The end of this work left me somewhat lost for something to do as far as stratosphere sampling was concerned, although my group did continue to contribute papers on general Astrobiology. The change in fortunes came in the late summer of 2013 when I was lucky enough to team up with two remarkable engineering students, Alex Baker and Chris Rose. These PhD students from the Tribology group of the Engineering Department here in Sheffield University are both expert electron microscopists and were running a company – Sent into Space – sending adverts by weather balloon into the stratosphere. We got together and designed a simple, but effective means of sampling the stratosphere at heights of around 27km. The result turned out to be amazing and caused a media stir around the world which continues to the present. A view from the stratosphere for the Earth taken during one of Alex and Chris experimental launches. 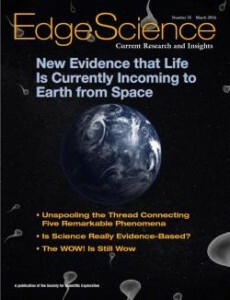 The results show that unusual biological entities can be isolated from the stratosphere at these heights and that they are continually incoming to Earth from space, and not as suggested, by others, to be coming up from Earth. Those images shows some of the biological entities that we have found in the stratosphere. 1) The BEs occur in very low numbers as isolated particles on the carbon sampling stubs which were exposed to the stratosphere. With the exception of a single diatom frustule fragment, known terrestrial organisms commonly found on Earth (e.g. grass seeds and pollen) are however, not sampled from this source. In addition material having the typical morphology and EDX signature of volcanic dust has never been seen on the sampling stubs. 2) The observed stratosphere–derived BEs is unusual and (with the exception of the diatom fragment) cannot be identified, by us, as terrestrial organisms (e.g. marine or terrestrial alga or protozoa). 3) The bimorphs are often associated with impact craters caused by inorganic, space-derived cosmic dust. 4) Some of the BEs themselves also produced impact craters on the carbon sampling stubs, again suggesting that they are incoming to Earth from space. 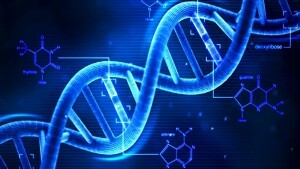 More recently, I have re-assessed earlier studies on the samples obtained at 41km and have provided evidence for the existence of biological masses containing DNA, as assessed by DAPI staining. During this work, I again teamed up with the Chandra Wickramasinghe and involve the input of a first–rate PhD student, Tareq Omairi in the work. The scientific community has remained remarkably quiet regarding our findings, despite the fact that the work has received vast media coverage. Tareq Omairi, my PhD student working on biological entities in the stratosphere. I have given talks at local, and international conferences, as yet no one has been able to provide an alternative explanation for our findings, other than the usual cries of contamination and, unthinking resort, to Occam’sRazor. The work has been published in peer reviewed journals. We are continuing with these studies and have recently sampled the stratosphere over Iceland during the Northern Lights. We expect that other groups, including from NASA will repeat our work; let us hope they give full recognition to our priority and not use the excuse that their studies have been done using better equipment which has avoided contamination! An image from our latest sampling trip in Vigdísarvallavegur, Iceland – March 2015. How do microorganisms reach the stratosphere?